We’re embracing a blended approach – combining inbound marketing automation with outbound telemarketing – to deliver an always-on capability which accelerates the lead generation process, quickly and efficiently targeting a broad audience. The service is built around an SEO optimized micro-site (or your existing web-site, if preferred) with hosted content, trackable links, and call to action forms. 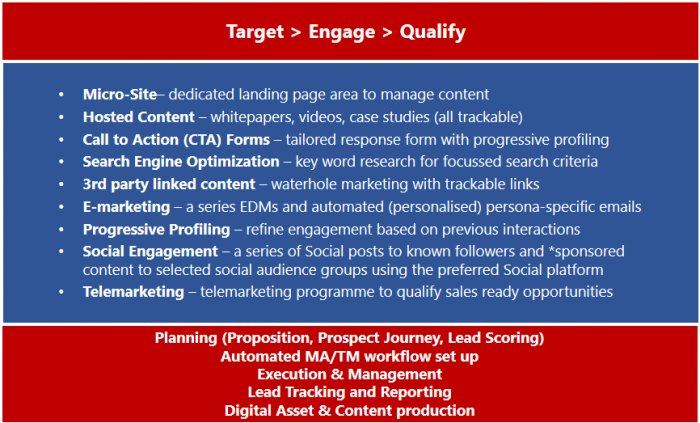 This site is augmented by E-mail marketing and Social engagement, using progressive persona profiling techniques to refine the messaging. The platform tracks and scores digital interactions and touch points which are used to prioritise outbound calling activity. As well as hosting and engagement, the service includes planning, workflow set-up, execution, lead tracking, and reporting. The planning phase is key. We will work with you to understand the value proposition, prospect journey, and develop a lead scoring algorithm. What problems does this service solve? Our digital services have been designed to address these issues and avoid many of the common pitfalls. By combining the best of both worlds, inbound and outbound, we can drive a more effective campaign with a higher conversation rate. Demand generation often involves multiple agencies, each responsible for a specific part of the process. A common example of this would be an inbound agency being engaged to generate leads from a marketing automation platform and an outbound agency engaged to follow these up. Timely follow up to the inbound leads is essential to help identify active buying opportunities. But, all too often, the inbound leads are passed across days or weeks after the initial digital touch point with the prospect. This disconnect creates an MQL/SQL gap, where the inbound leads are not followed up soon enough. The underlying weakness is that the two key elements of the marketing engagement process are being executed as separate processes (different departments and/or different agencies). ITTS has traditionally been positioned in the outbound role and we have experienced this situation many times. No surprise then that interest in the value proposition has degraded by the time our agents get to speak to the prospect. This has an adverse effect on ROI for both the inbound and outbound activity. In response to this, ITTS has developed a solution and introduced a blended engagement model which combines both inbound and outbound activity, which is – crucially – delivered by one provider using a fully integrated approach. ITTS work with clients to design, deploy and deliver discrete MA programmes using our own platform and consultant team. All digital interactions are monitored, tracked and alerted so that our agents can engage in a timely manner, thus ensuring the MQLs are given the best chance of being converted into genuine SQLs for our customers sales teams. In short, we can ensure our outbound agent teams are tightly integrated with the inbound activity. This makes for a more effective outcome and ROI for the campaign.